I am going to Berlin next month. My timing is good, because the German capital is flavour of the month in the media at the moment. The papers are full of reports about the fall of the Berlin Wall twenty years ago this month and there have been plenty of TV documentaries on the city. I have been reading and watching with great interest and making notes-to-self on things to see and do. But then I got thinking about how best to approach a visit to a city such as Berlin. There is much more to Berlin than just the Wall and the Third Reich. Is it "right" to visit the city with pretty much only those two historical events in mind? As an aside, something that was largely forgotten in the celebrations surrounding the twentieth anniversary of the collapse of the wall this week, was that 9 November was also the date of the November Pogrom in 1938 (also known by the Nazi term Kristallnacht) when 91 people were killed. But back to the questions. How, in this case as tourists, should we value the relative importance of events in history? It would be easy to spend four or five days in Berlin viewing nothing but the wall, the Holocaust memorial, the Stasi musuem etc. etc. But wouldn't this skew our appreciation of history? What about the contemporary arts scene in Berlin? What about the Berlin of the nineteenth century? What about its art collections and galleries? 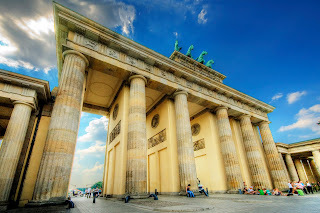 What about following the footsteps of famous people who have lived in Berlin as you would in many other great cities. The list includes Edward Munch, Marlene Dietrich, Vladimir Nabokov, Kurt Weill, Felix Mendelssohn, Hegel and Humboldt to name but a few. And what about the great Berlin cabaret tradition? There is more to Berlin than is currently meeting the eye courtesy of our slavish and simplistic media. For my guide, tune in next month.